The firm provides consulting services to clients in two distinct areas of expertise. The first centers on a highly customized and systematic career development process. The second provides expert witness services for patent litigation. In today’s highly dynamic work environment where highly disruptive technology is the norm, each individual must take even more direct responsibility for their career. Even in the best of times, it is often very difficult for a person to discover the purpose and meaning for what they do at work. The Continuous Career Invention experience provides a proactive and persistent path for an individual to create a career that not only brings value to society but also becomes a much better fit to that person’s interests and skills. The individual becomes invigorated by the work they do and the career has a deep sense of meaning. 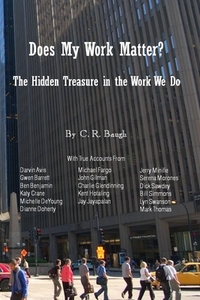 Dr. Baugh's book, Does My Work Matter? The Hidden Treasure in the Work We Do, outlines a "vantage point" from which people can more easily discover the unique purpose for the work they do. The content includes eighteen stories from ordinary people who navigated the twisting and turning path of discovery. The stories prove that people from many different walks of life eventually uncover their personalized purpose that becomes a deep motivating force for the work they do. They bring meaning to work rather than trying to extract meaning from work. The book is available in paperback or in Kindle format. The advent of an era in which intellectual property has become an increasingly integral part of a manufacturer’s cost of doing business, patent issues have become a more common area of dispute. Dr. Baugh’s expertise in telecommunications technology becomes a key asset when navigating the legal process of litigating patent disputes. His broad range of technical knowledge and his depth of understanding provide a sound foundation for analyzing patents – invalidity and noninfringement. Dr. Baugh began his career at AT&T Bell Laboratories. He is a Fellow of the IEEE. Copyright 1995-2016 C. R. Baugh, Ph.D.